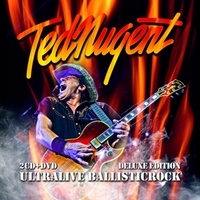 When Ted Nugent started more then 3 decades ago he seem to take the music world by storm. His first 3 studio albums all got multiple platinum certifications in the USA and got at least gold status in Canada. The Nuge kicks off the show with the 1976 title track Free For All. The show was recorded in August 2011 and was one of the first after the return of rhythm guitarist and singer Derek St. Holmes. The band is complete with bassist Greg Smith and drummer Mick Brown. If you take a look at the track listing you'll see that the Motor City Madman is focusing on this classics and spiced up the set with some new tunes like Fred Bear. Sometimes there is a bit too much talking between the songs, but that and hearing the audience gives it the real live feeling - and it would be awkward at the DVD / BluRay if it would be missing. For fans of The Nuge this is surely a must-have, even if it isn't a milestone like Double Live Gonzo. But well done!